Captain Scarlet Pokie Review - Play today! If you enjoyed the marionette based television series based on science fiction, you will recognize the symbols and know that this pokie is lifting off to Eunomia and that earth is safe now that the unkillable agency is fighting the extra-terrestrial terrorists. OpenBet designed this pokie to offer fantastic wins to all the Captain Scarlet fans and kept the symbols original and all players who are not familiar with the series will enjoy the fun and the enormous winning opportunities. The fun starts on 5 reels with 30 paylines and a great selection of features which includes wilds, scatters and bonus rounds. The large coin denomination makes betting easy with a minimum bet of 0.01 per line and the maximum bet accepts up to 25.00 per spin. The jackpot bonus offers a 300 coin payout. The reels offers great looking symbols and is framed in a grey metal shaped operating board with outlets indicating the payline numbers. All the functional buttons offers easy access with clear indications at the bottom of the screen. 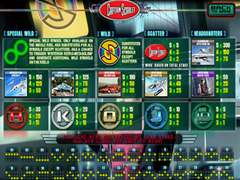 The symbols offer the red spectrum saloon car, the white interceptor aircraft, interesting spectrum helicopter, cloudbase spectrum headquarters, spectrum hover pack, spectrum pursuit vehicle, captain black and the poker symbols are indicated in circles. The symbol appearing with the yellow S in front of a multi-coloured disk will be displayed as the wildcard, which means it can give you great winnings when appearing anywhere on the reels during the game. You will be able to get multiple wilds in one spin, but getting only 1 will also advance you the features that it has. 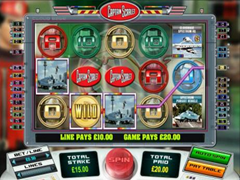 The game has a special wild symbol as well that will only appear on reel 3, it is presented by 2 green rings and will complete all the feature of the S wildcard, but what make this symbol special is the fact that it will be able to reward you with even better winnings as normal symbols will be turned into wilds, the symbols that are change are selected at complete random. The scatters bring you the game logo on a red oval background, because they are scatters you will not need to get them on any paylines to complete scatter winnings, you will however need a minimum of 3 at a time, when you manage this you will receive multipliers for your total wagered amount. A really fun pokie offering very interesting symbols, which are well illustrated and great to spin on the reels into generous winning combinations. The features offers wonderful additional wins and smooth play are really impressive on the game and even more reason to return to it in future.